I seem to be the Northwest’s new homemade-dairy evangelist. First it was ricotta, and now I’m encouraging the good people of Seattle to make butter – cultured butter, no less. Watch out, next thing you know I’ll be telling you to adopt your own cow. For the skinny on churning up a batch of the tastiest toast-topper around, open your copy of today’s Pacific Northwest Magazine, or just click here to read it on the Seattle Times website. 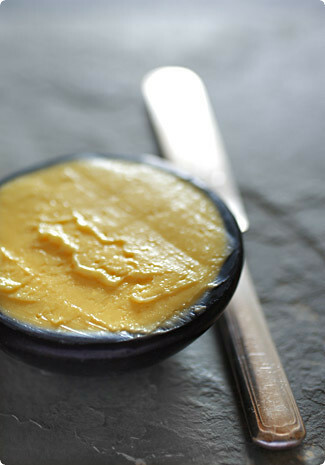 Homechurned butter really is far superior. My grandparents always made it. I must try this!! Thanks for sharing. Oh, no – I read the article and now I may have to do it. It just sounds so darn good. DId the finished product come close to what you had in France? Italian dish – I would say it comes close. It really depends on the cream you use, though – you may have to try a few different kinds before you find one that really has an exceptional flavor.Watch – The best cream for this is non-ultrapasteurized heavy whipping cream. I have actually made butter from ultrapasteurized cream, but it is much more difficult. The organic part is of course optional, but I’ve found that organic creams are generally more flavorful. As for the culturing component, it can be anything that contains live cultures. I normally use Nancy’s organic plain yogurt. Good luck! This post made me smile. Growing up in Oregon, I used to churn butter with my grandparents. It’s one of my favorite food memories. Thanks for encouraging others to get back to the basics of this oft taken for granted staple. The picture is making me salivate! This is one of the best things to try when living in the countryside. Oh, I miss my ol’ cow Jemi. a strange feeling of deja-vu…but at least i might make it this second time round. my boyfriend is perfect in every way but has just admitted to me that he DOESN’T LIKE BUTTER! hopefully this recipe might change his mind because if you love me, you have to love full-fat dairy products! You know, one of the key things I’ve learned at school (I’m a culinary school student) is the value of the little things: The most flavorful salt, the richest butter, the freshest nutmeg, and so on. That appreciation for flavor, plus technique, is the difference between the professional chef and the home chef. Well, that and a dash of inspiration.Cheers! fresh butter = yummy. Our lovely paper does have exciting culinary information once in a while. cool photo with classic flavor!^_^ I haven’t realized that food can be influenced mutually to such a degree and I’m glad to read what you write down in your blog! Cultured butter is indeed one of my favorites, glad you love it, too! Oh my goodness! I read that article with great interest, because we make our own butter too, but not cultured. I have been meaning to try it for some time. But I just made the connection: that was you! Congratulations. And my goodness, when are we going to meet? We’d love to you out here for a visit and a meal involving butter. Gorgeous, gorgeous blog. I look forward to going back and reading from the beginning. Just wanted to say, though, that your cultured butter recipe has my heart racing. I may have to make a raw milk run ASAP and try this today on my day off. Thanks for a wonderful post. I’m a new blogger, so this is inspiring. Cheers to you. It’s interesting… there is something very satisfying in making basic staples (like bread, yogurt, cheese, …) at home. It brings us back to our ancestors. I will have to try, one of these week-ends. I made your butter, and your ricotta. True satisfaction in cooking. Actually I made two kinds of ricotta, a goat and a cow’s. The real dairy ricotta was the tastiest, creamiest, mascarpone-est style ricotta I’ve ever had. The goat one was great also but this just took the proverbial cake.I also made your pear and cardamom. Your recipes are a real dream. Ok this is the straw that broke the camel's back. This post made me decide to finally make a "things to make after Lent" folder in my bookmarks, there were just too many bookmarked recipes of yours that I plan to make piling up lolll! I bought cultured butter once but couldn't tell the difference between that and regular butter. Now I'll have to try this! My mom used to make butter at home when I was a kid, it's cool that I'll be continuing her tradition! Thank you so much for this!